The HEINKEL Drying and Separation Group convinced a global player in the USA with the outstanding features of the unique centrifuge basket made entirely of duplex stainless steel. In the field of machine upgrades and retrofits, the HEINKEL Drying and Separation Group has had its competence put to the test. One of the worldwide leading manufacturers of collagens and gelatines from the USA commissioned the group with the modernisation of a third-party centrifuge. The original centrifuge basket with a large diameter of 1,725 millimetres was completely corroded and no longer usable. Furthermore dismantling the centrifuge basket from the drive shaft had become difficult. Therefore the customer decided to refurbish the centrifuge and replace the basket. After consultation with HEINKEL Drying and Separation Group the US Company chose a HEINKEL basket made entirely of duplex stainless steel which when compared with the conventional construction has decisive advantages. 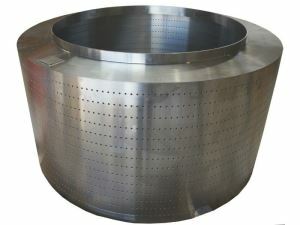 Centrifuge baskets of cladded construction are at risk of cladding detachment and cracking due to vibration and the routine stresses of operation. This can result in product ingress between the clad layers in a way that is not visible to the naked eye. This often results in prolonged unplanned downtime. The duplex stainless steel construction offered by HEINKEL eliminates the risks associated with clad centrifuge baskets and gives the customer a far more reliable solution. Based on its long-standing experience and continuous product optimization the HEINKEL Drying and Separation Group has developed solutions which increase efficiency and profitability of production plants. This also includes third party products like the centrifuge basket made from duplex stainless steel. Thanks to the professional support for the modernization of the centrifuge basket, the US manufacturer of collagens has placed a further order with the HEINKEL Group.